Its time for part two of the Trickery Knit-a-Long. This has been an experience for me, very different. Having my hands and cowgirl boots in front of the camera is one thing. Having my face? Turns out that’s a whole different affair. Turns out I’m a bit camera shy. Turns out my hair is much frizzier than I thought. b) I can live with the dorky related shyness if you can. And its the Trickery Knit-a-long! We have to check in with each other right? Right. I’m through the first edge section. Time to start the center section of the stole. 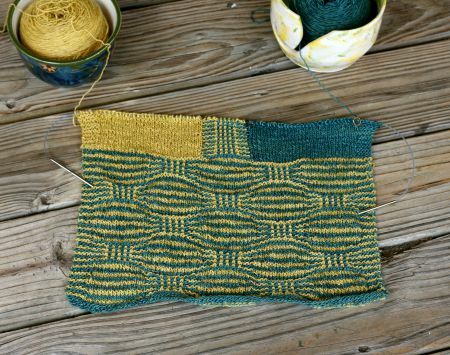 For those of you who are knitting with me, I hope you’re enjoying this pattern. The edge sections have that “need to concentrate a little” element to them. The center has that “I’ve done it once and don’t need to check the pattern for a while” thing going on. I like that mix. When I knit (and especially when I’m designing a knit) I want just enough stuff going on to make it interesting but not so much that the project is hard. I hope that’s the way this is working out for you too. The yarn I’m using is working up beautiful. Its from an indie hand dyer, Bronotta Yarns One Only – Silk. 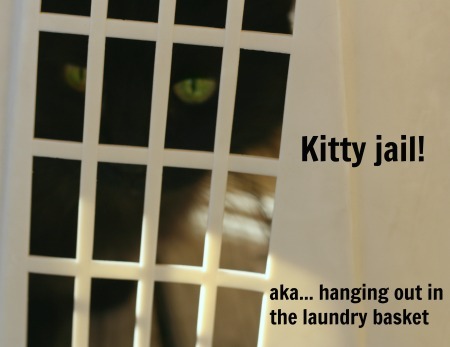 The dyer asked me to try it and see what I thought of it. I said yes and nodded somberly and pretended that I would be impartial and serious about this. But on the inside I was squealing. I knew I would like it. I’ve used other Bronotta Yarns and like them all. And I’ve fondled this Only One Silk stuff in stores enough to develop a craving for it. So its not a surprise to me that I like the yarn. Its got that gorgeous silky sheen to it. Also, its a balanced single and I love working with balanced singles. My long-tern goal as a spinner is to spin better balanced singles that can be used without plying (I cheated on the Trickery Knit-a-Long just a wee bit this weekend and worked on my spinning). I may have plenty of knitting left to do on my Trickery but I already know that I’ll be recommending this yarn to Allison at The Sated Sheep , who is considering adding it to her line of other artisan yarns. What ya’ll working on? Trickery? Something else? 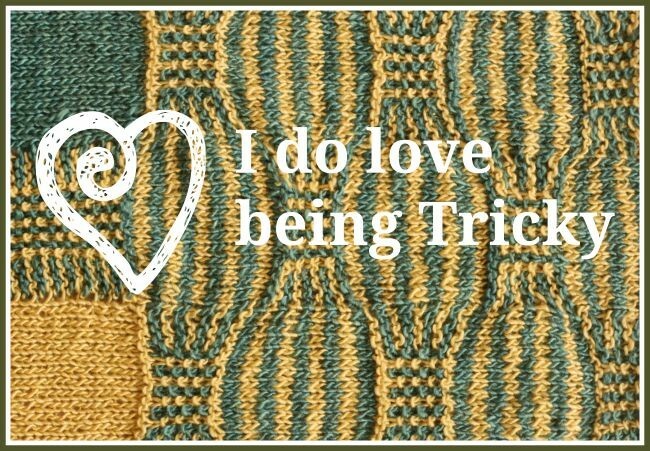 12 Comments on "Trickery Knit-a-Long! Starting the Center"
I’m working on the Sylvi jacket for my sister-in-law’s Christmas present. I’m using Berroco Vintage Chunky and while I wish it was a bulkier yarn (I think I really needed something a little bulkier) it feels awesome and the Douglas Fir colorway is working up beautifully! Sounds lovely. That Vintage chunky is pretty yummy stuff. And it may be chunkier that you think. As I recall it has a nice “bloom” when its first washed. Jenn, I am still here. I have one section left before I start the center. Had trouble posting my picture. Haven’t given up yet! Sigh. I’m on with Tech Support right now about this comment/image thing. They are sending in “test” comments and trying to get to work from their end. Here is hoping. Hope you are liking the pattern! Didn’t go so well with Tech Support. Ugh. Computer stuff is hard. I apologize for the hassle and frustration. As for uploading images it seems I’m going to have to make a major-ish upgrade and go with a full-service comment management system if I want that to work. That will take a bit of time to get into place. It’s okay. I can post on G+. More work for you though. Since I currently don’ knit I am crocheting along on a ripple baby ripple afghan, hat and booties on commission. She bought the yarn…Lion Brand Baby in Auburn Univ colors (orange and blue). They are big Auburn alumni. SEC football is another religion in the South. Yarn works up nice with no splitting. The biggy is that my first ever hand made yarn cakes are pulling beautifully! I haven’t been this excited since I learned to do a russion join! Is this what’s called a boring life?? Oh yay! Yarn cakes are the best. They make everything just that much easier. You may be boring, but then so am I. I love to play with string and it doesn’t get more boring than that. Wow. Wowowow. You are almost done? Jeez that’s fast. that’s awesome and I’m so glad you like it! 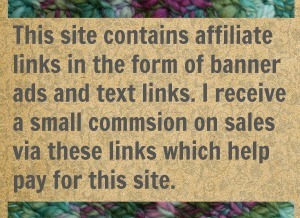 Do you have a ravelry project page? I’d love to get a peek at it. But if you feel that they are too big or you just don’t like them, you can be more careful about pulling the needles & stitches apart when you stop&turn. Also any hole in knitting can be closed up by some strategic tugging on those loops.